I’m the kind of person that loves wellness and healthy living, but that doesn’t particularly enjoy working out. This is because I like things to be pretty and clean, and I also enjoy a peaceful environment. 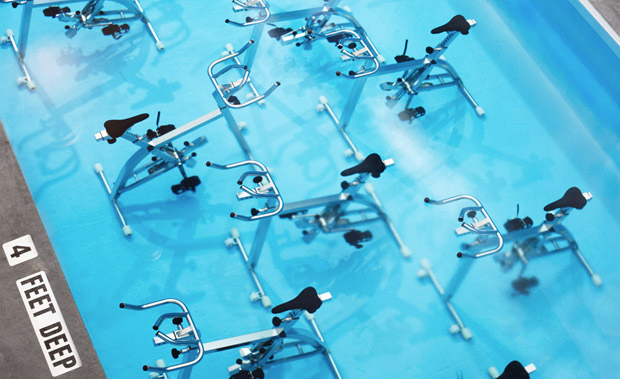 Fortunately, AQUA, the new high-end fitness club in TriBeCa, seems to offer all of the above and more with the studio’s popular Aquacycling classes. Cycling underwater is more effective than in a traditional gym because the water prevents soreness and joint pain as well as increases blood flow (helps get rid of cellulite), improves cardiovascular endurance, and promotes flexibility and recovery. It sounds like an AMAZING way to get aerobic exercise without killing my knees. It also doesn’t hurt that the boutique is beautiful and European.